TWO PRODUCTS FOR THE PRICE OF ONE! . SAVE 20$!!! 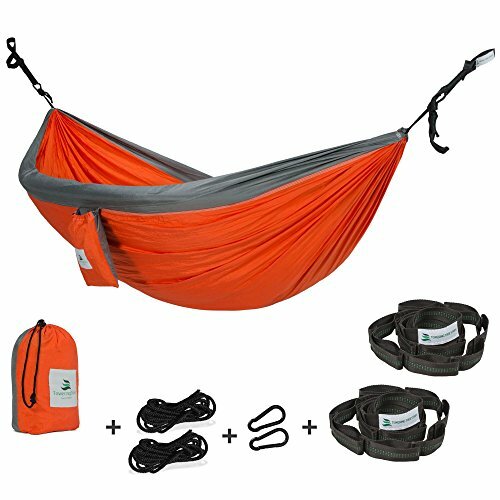 Your order will contain a parachute hammock plus very strong tree straps, so your hammock will never slip off of any trees, poles, rocks, or masts. These are reliable straps, and the hammock is made with parachute nylon 210 fabric that has been triple-stitched for a maximum capacity of 500 pounds (227 Kg). The straps attach to steel carabiners, and the tree straps are adjustable and non-stretching, made out of spun polyester. LIGHTWEIGHT AND PORTABLE, this hammock is easy to carry. The hammock and the straps fold simply, making it compact for transportation. This is ideal for hiking, traveling, camping, and boating, whether you want to use it indoors or outdoors. SO SIMPLE A CHILD CAN FIGURE IT OUT. Select any two sturdy objects that are separated from between 10 and 13 feet and then wrap the straps around them, passing the strap ends through the loops and attaching hammock carabiners to the loops. After that, you are good to go. LARGE ENOUGH TO FIT 2 PEOPLE COMFORTABLY. This double hammock is approximately 118x79 inches (300x200cm), meaning it is big enough for 2 adults or several children. BRIGHT COLORS, STILL MAKE IT EASY TO CLEAN. The parachute nylon silk is super durable and breathable, so whether it is dry or wet, it is a breeze to maintain. Save 20$ on tree suspension system (its already included)!!! This camping hammock by Towering Tree is available in three color combinations (orange/gray, khaki/green and navy/blue), and each unit contains a parachute hammock plus a pair of hammock straps, everithing you need to get set up and lounging in your yard, in your ocean hammock resort, or anywere else. Constructed with parachute nylon fabric, a material known for its sturdiness and its comfort, this high -quality beach hammock will hold as much as 500 pounds. This hammock is perfect for travelling, engineered with portability in mind, and its dimentions are approximately 300 centimeters by 200 centimeters.